Lunch at the Shop (Abrams Image; March 11, 2014; Hardcover; U.S. $24.95/CAN. $27.95; ISBN: 978-1-4197-1065-0) is a call to lunch. On the most basic level, the book is a primer for making lunch for a few people at work, including more than 45 tried-and-tested, deliciously simple recipes. However, the essence of the book is about adopting a lifestyle that allows food to be savored every day, in a way that is easy, fresh, healthy, and a pleasure. In our current bustle, lunch has been outsourced to stand-up counters, reduced to takeout platters, wrapped and rolled and packaged. But it doesn’t need to be so. Peter Miller makes lunch every day at his bookshop in Seattle. It may be only a salad or a sandwich, but he and his team put it together each day without a formal kitchen. It is a moment set aside, away from the computer and the clock. Excerpted from Lunch at the Shop: The Art and Practice of the Midday Meal by Peter Miller, with photographs by Christopher Hirsheimer and Melissa Hamilton. Copyright © 2014 by Matthew Kennedy, Christopher Hirsheimer and Melissa Hamilton. Reprinted by arrangement with Abrams Image. All rights reserved. Support your local bookstore, or buy the book through our affiliate link at Amazon.com. 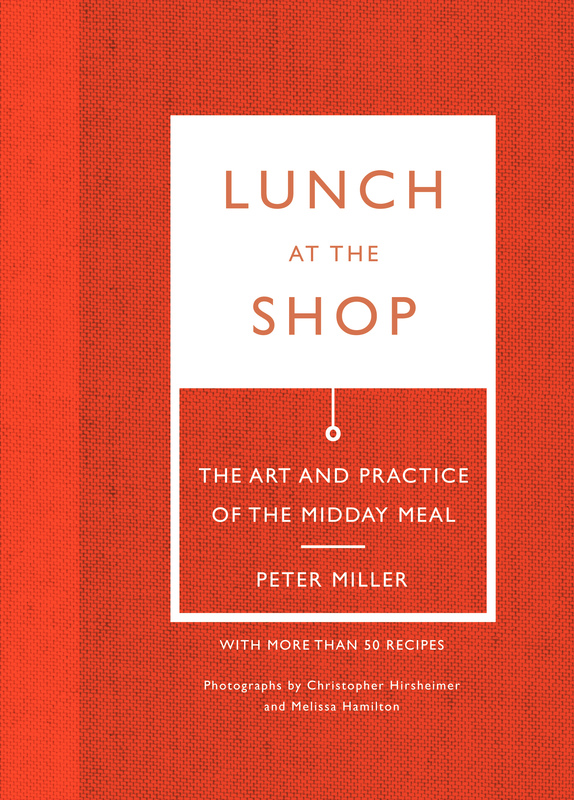 From the Introduction: “Lunch at the Shop argues for stopping for a moment and against certain grains of habit, perceived convenience, and low expectations. Making lunch together is a gentle protest to people not speaking or listening or sharing; it is a counter to a body of people bent in isolation over their cell phones. “In actual time spent, making lunch at the shop is a modest expense. You will divide a few labors, often someone must pick up provisions on the way to work, and there may be ten minutes of prepping. But once you have begun the process, lunch seems to find time to create itself. And in a sense, it is pure self-interest—you are simply investing in a better meal. Once I have cannellini beans cooked and saved in the refrigerator, all sorts of meals come to mind. Our butcher was laying out fresh sausages, and I could imagine them, cooked and charred, sticking partway out of a bowl of white beans, parsley, and black pepper. This is a soup that needs good parsley, and plenty of it. Heat a small sauté pan over medium heat for a moment. Add 1 tablespoon of the oil, and heat for 1 minute. Add the sausage to the pan. The heat must be lively enough that they sizzle but not so intense that they burn—adjust it accordingly. Cook the sausages for 6 to 8 minutes, turning them several times while they brown and cook through. Remove them from the pan with a slotted spoon, and set them aside on paper towels to drain. Add the beans, stirring them into the oil and garlic. Season with some salt and pepper, and cover the pan. You want the aromas to infuse the beans. Cook the beans, covered, for 3 minutes, and then stir in ½ cup of the stock. Using a slotted spoon, remove about one-third of the beans and process them through a ricer back into the pan. This will thicken the soup. Gradually add the remaining 3/4 cup stock to the mix, stirring and keeping the mixture at a simmer. The warm stock will loosen the soup, so add more or less to reach the consistency you desire. 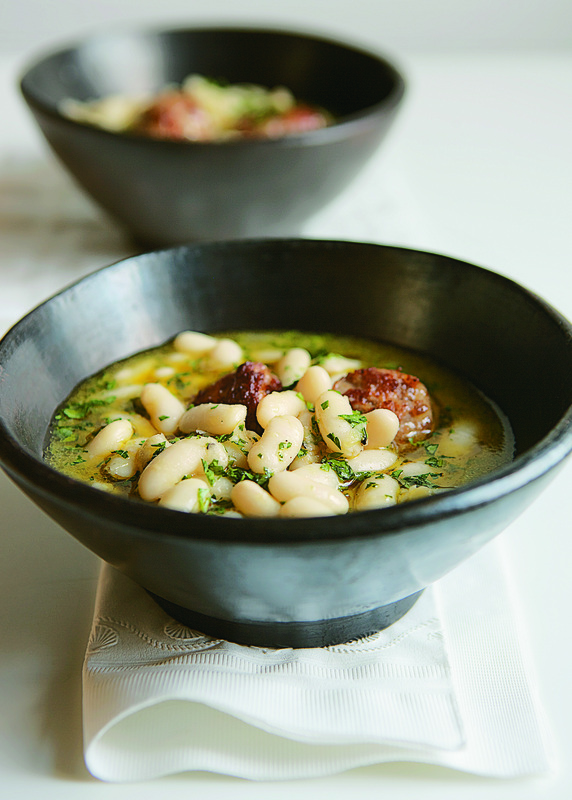 You will find the balance of the whole beans and the mashed beans and the liquid—that is your soup. Taste and season with salt and pepper, add the sausage and the parsley, and stir to combine. The soup will keep in an airtight container in the refrigerator for 3 to 5 days. It is a simple sandwich to make, and quietly popular. The small pieces of chicken are tender and a little crunchy from the breading. The chutney brings a sweet taste from underneath. The lemon and the fresh pepper keep it all sprightly. Serve the sandwiches as soon as they are assembled, for they rely on a certain freshness and on the parts remaining slightly separate. Bring the chicken out of the refrigerator and let it warm up on the counter. Cut the bread or the rolls in half, on the horizontal, and lay them out like open books so you can work on them. Cut the lemon open and squeeze it on one half of each sandwich. On the other side, spread the chutney to lightly cover the surface. Peel and slice open the avocado, remove the pit, and lay the two sections on a plate. Cut them into slices. Then sprinkle some salt and some chopped parsley or cilantro over the slices and add a good squeeze of the lemon. The breaded chicken is best cut on a diagonal and across its grain, which runs the length of the breasts. You should get four or five pieces from each breast. Portion them out on the lemon side of each sandwich, and spoon any of the sauce directly onto the pieces. Using a tablespoon, put two or three slices of the avocado on top the chicken and the sauce. Take a handful of the arugula and lay it on the chutney side of the sandwich; the condiment will help hold the greens in place. Tip the plate that held the avocado slices over each sandwich to let the lemon juice run off, add a pinch of salt and some fresh ground pepper, and fold the two halves together. When you serve the sandwich, it would be fitting to add a tablespoon or two of a rice or lentil salad alongside—something with a fresh taste of grain and perhaps the bite of raisins, nuts, or fine-chopped vegetables mixed into it. Variations: Sometimes we will add a tablespoon of Greek yogurt to the lemon side, and some extra chopped parsley or cilantro, making a kind of spread. 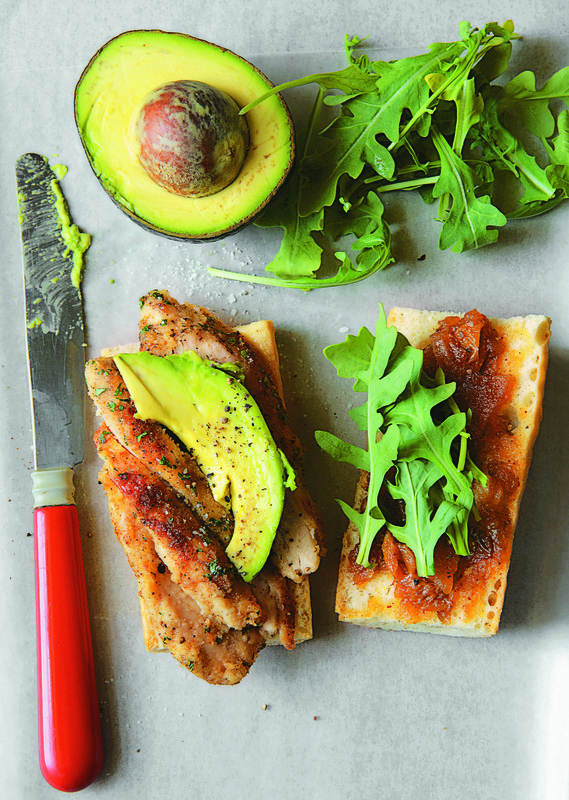 It gives a wonderful freshness—and a little messiness—to the sandwich. If you had some leftover green sauce, or salsa or tartar sauce, they would each be a fine partner on their own to the chicken and avocado. 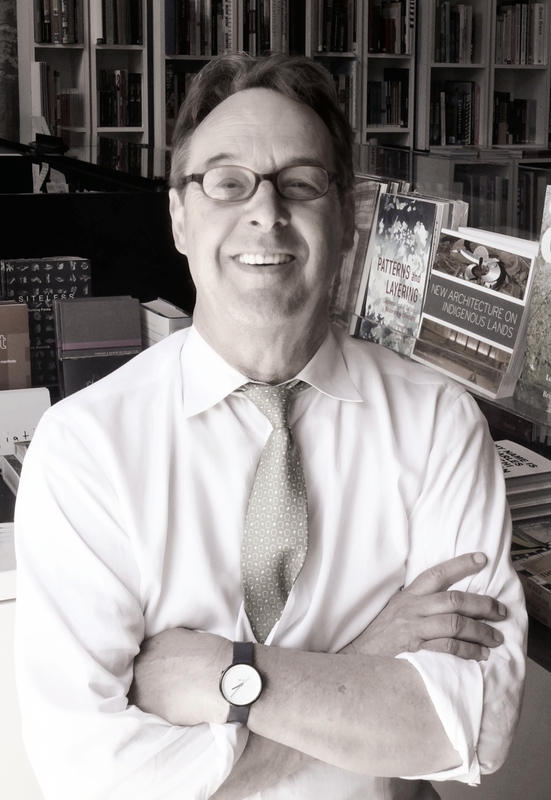 Peter Miller has operated his design bookshop in Seattle for 35 years. He trained as a chef with the remarkable Maurice Thuillier and is a regular contributor to the online magazine Crosscut.com. Christopher Hirsheimer, an award-winning photographer and editor, and Melissa Hamilton, a renowned food stylist, are the cofounders of Canal House and the authors of the James Beard Award–winning Canal House Cooks Every Day. This entry was posted in Eat and tagged avocado, bookstore, chicken sandwich, cookbook, easy meals, Eat, recipe, white bean soup. Bookmark the permalink.